I made you cookies! Gluten Free Chocolate Chip Cookies. The other day I shared a Healthier Chocolate Chip Cookie recipe. They were not gluten free cookies. It was a recipe I had created a while back. Nowadays, I am doing more and more gluten free baking, so I thought I would try a gluten free chocolate chip cookie recipe as well. These healthy chocolate chip cookies came out better than I expected. These chocolate chip cookies are super moist and delicious. They would be great for a holiday cookie swap or just for dessert! 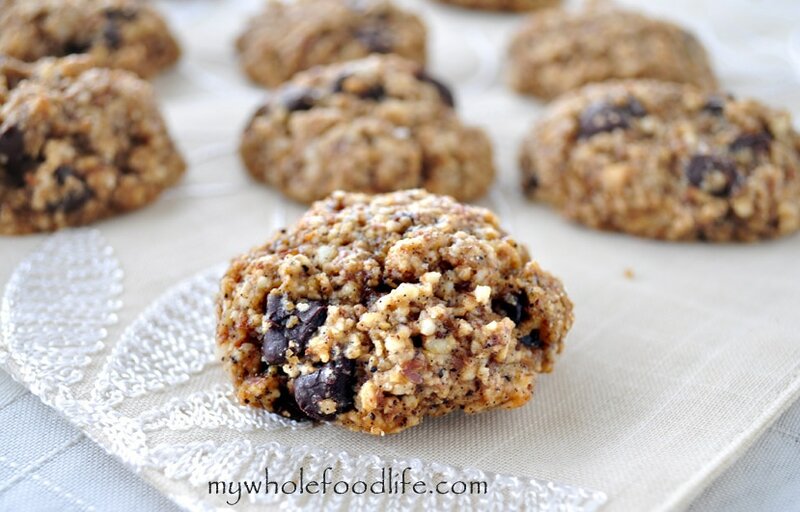 These healthy gluten free cookies are also vegan, egg free and dairy free! A gluten free, healthier version of the classic chocolate chip cookie! In a blender or food processor , mix the cashews, almonds and oats until a "meal" forms. Pour contents into a bowl with the rest of the dry ingredients. Mix all the wet ingredients into another bowl. Drop cookies onto a lined baking sheet . Smart! You blended the nuts. I know to make a healthy and moist cookie is a challenge. I'm working on one recipe now too, so I know. I look forward to trying yours as well. Oh duh! I forgot to add them. Editing the post now. May not be gluten free, but the Real Foods Daily recipe for Chocolate Chip Cookies is healthy and delicious! These look great but I was wondering do the almonds have to be slivered? Can I just toss whole in my food processor or is important to cut them up first? Thanks for the recipies!! I love your blog. Thanks Katie! No they probably don't. I just had some extras lying around and that's why I used them. These look amazing! Can't wait to try them! Could we use a different sweetener? I don't have sucanat - do you think it would work with coconut sugar or honey? Thank you! Coconut sugar would work perfect. Very similar to sucanat. Thank you! I used raw cashews. If you use salted, just don't add any extra salt to the recipe. Flax eggs are easy to make. 1 tablespoon flax meal + 3 tablespoons warm water. Whisk it together and throw it in the fridge for a minute. It will become gummy like an egg. Works great! My daughter is sensitive to even the gf oats, do you have a suggestion on what else to use? You can try using GF all purpose. Gosh, these look AMAZING! I think I'll make a batch this weekend!! :) Love your blog! Thanks Heather! I hope you enjoy the recipe! These cookies do sound good BUT I'm allergic to nuts so how do I revise? Can just use gluten free flours? I am thinking you could probably use 1 cup of gluten free flour. My sister has celiacs so I'm always keeping an eye out for tasty recipes to make her, and these were quite tasty - my only problem is mine end up flat, not puffed up like yours. Any thoughts as to why that is - am I adding just a touch too much liquid? Any advice would be appreciated! Thanks! So sorry you had an issue with it. :( Can you add more oats the mixture to help? Maybe the eggs were large? I'm not sure since I made it with flax eggs only.